Sharing health stories and learning from one another in an unpaid way (like in-person mentorship, online chats or phone calls) is known as peer health advice or peer-to-peer health care. The internet has made finding other people with your health problem easier. For example, the Database of Patients’ Experiences is an international collection of videos of patients sharing their experiences about various health conditions. This kind of sharing is similar to something humans have always done. When we have problems, we discuss them with others. We routinely get advice about where to get our car fixed and which plumber to call, for example. One in four people receive information or counsel from someone with a similar condition. Few of us can read everything about our condition. Those who have gone before us can help sift through the mountain of information for what’s most useful. Studies of diabetes management found that those who participated in peer-to-peer health care lowered their blood sugar level more than those who didn’t. Studies of the effect of peer-to-peer health care in a variety of other areas, many of them randomized controlled trials, show the same. 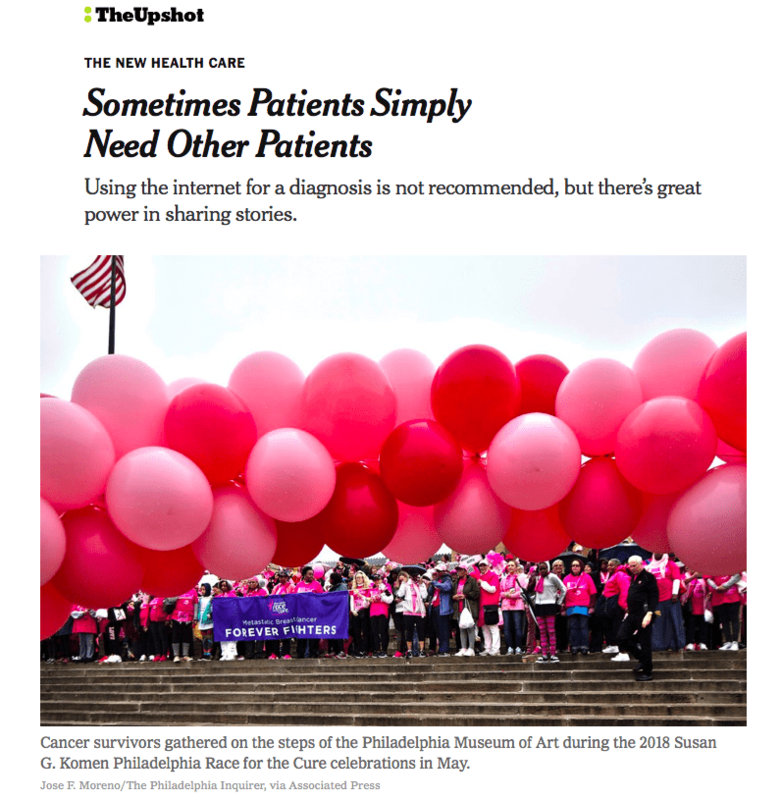 For patients to share with other patients similar medical conditions and experiences is important and a valuable tool. But one key gift a patient can offer another, especially if a life threatening illness is one the table, is a shared sense of fear and hope. Terror, uncertainty and “going it alone” can be paralyzing and the notion of hope may not even be on the radar. But a sharing of these feelings, doubts and fears with a patient who has been down that road can be the best emotional medicine there is. There is not only “power in sharing stories”, but also a sense of relief, comfort and familiarity. This is a wonderful and encouraging idea and a much needed article to share with the readers. I know a few people who could benefit from this “caring is sharing” approach. Thank you NYT for running this story!! While most of the article and comments are focused on major life-threatening illnesses, often getting to talk with person who has been-there is good for those of us who undergo what are considered normal procedures. I’ve had two Total Hip Replacements. Fortunately, I got in contact with someone who had the same procedure by the same MD in the same hospital before the first surgery. That contact made a huge difference to me and I’ve passed along my experience to others. It isn’t always the big issues, usually it is the little things that the medical professionals gloss over. Knowing what to expect and what to be careful of makes the whole process less frightening and daunting. Knowledge is power and when you’re feeling powerless it is important. What examples would you add? How has peer-to-peer connection affected your life? If anyone reading this knows where I can find those studies — or any similar — please post a comment here! Conference organizers: Steal these ideas!